Whispers in the Loggia: "This Is Madness, People": In Surprise Cameo, Scranton Bishop Repudiates USCCB, Dems, Et al. "This Is Madness, People": In Surprise Cameo, Scranton Bishop Repudiates USCCB, Dems, Et al. A presidential election forum at St. John’s Roman Catholic Church on Sunday centered mainly on abortion. 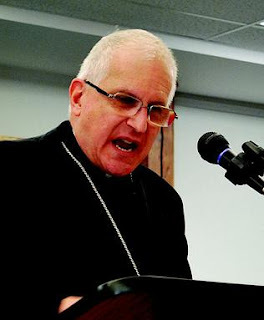 Martino, who arrived while the panelists were stating their viewpoints, took issue with the USCCB statement, which was handed out to everyone at the meeting, and also that his letter was not mentioned once at the forum. His letter, published Sept. 30 and circulated throughout the diocese, states that a candidate’s abortion stance is a major voting issue that supersedes all other considerations due to its grave moral consequences. Martino also said that he wanted to persuade Father Martin Boylan, of St. John’s, to cancel the forum. After his comments, most of the audience stood and clapped loudly while some were angry that the bishop usurped the forum. About a quarter of the audience left after the bishop’s comments, which preceded the last half of the forum, a question and answer session with the panelists. Martino exited shortly after his comments. The Scranton prelate was absent from last November's USCCB meeting in Baltimore which -- in a rare show of (near-)unanimity -- passed the Faithful Citizenship statement with 98% approval from the nation's hierarchy. SVILUPPO: Further developments here and here. Biden: "Not a JP Guy"
"Judgment Day Is On Its Way"